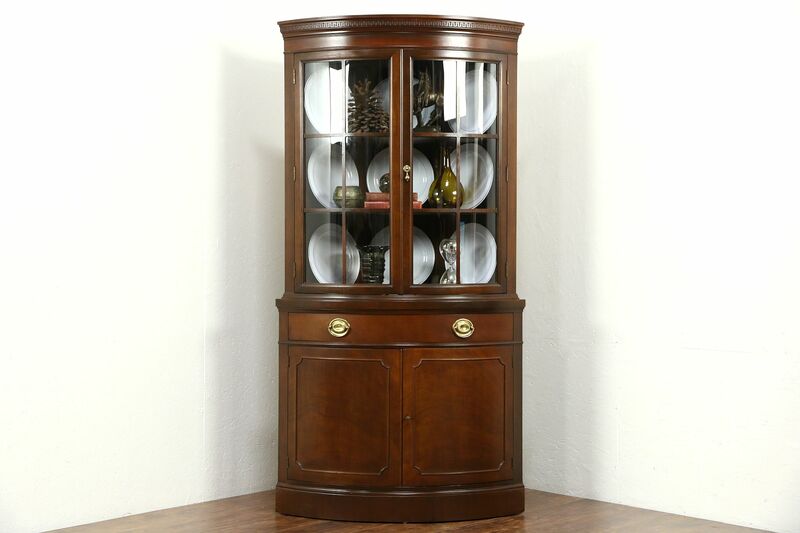 Signed "New Travis Court Collection by Drexel, Oct. 1949," a traditional corner cabinet has curved glass doors. The restored finish on mahogany preserves a few mars at the edges for a little character, see photos. Upper shelves have grooves to display plates, the drawer has original brasses and solid oak dovetailed sides. A lock and key secure the lower curved drawers on this American made vintage furniture. Size is 39" across the front, 70" tall and measures 25" from the corner of the wall to the edge of the crown.